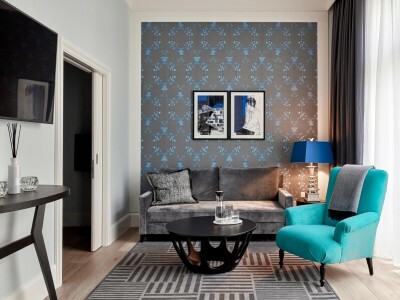 • courtyard or street view Timeless elegance, luxury and comfort are offered in the rooms of the Small category. 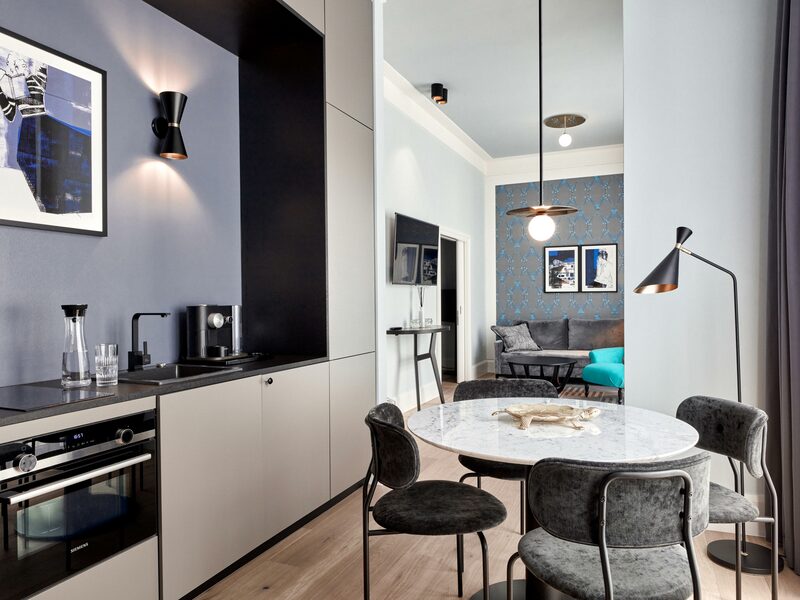 Thanks to a ceiling height of 4 m, the 21 - 24 sqm large rooms have a very spacious feel. Partly French balconies offer a quiet view of the historic Treppenhof. 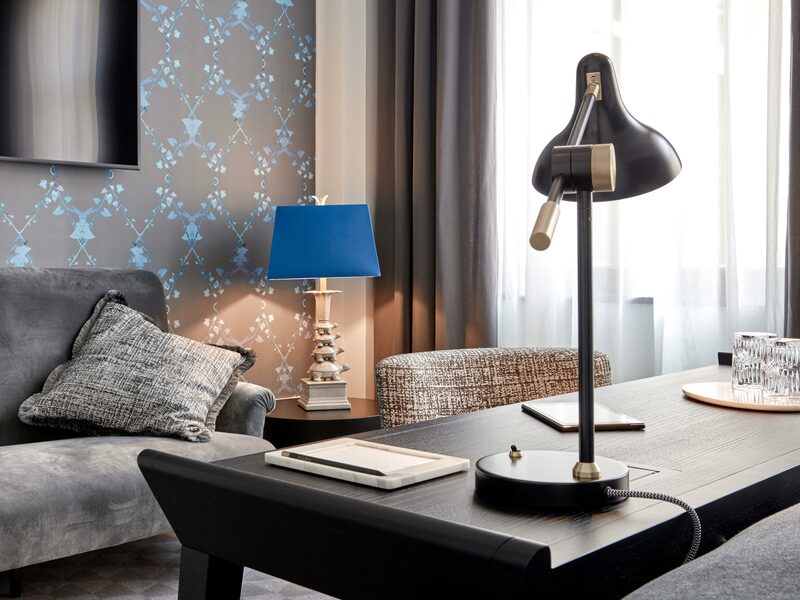 Subtle colors, high-quality materials and selected fabrics guarantee a relaxing stay. 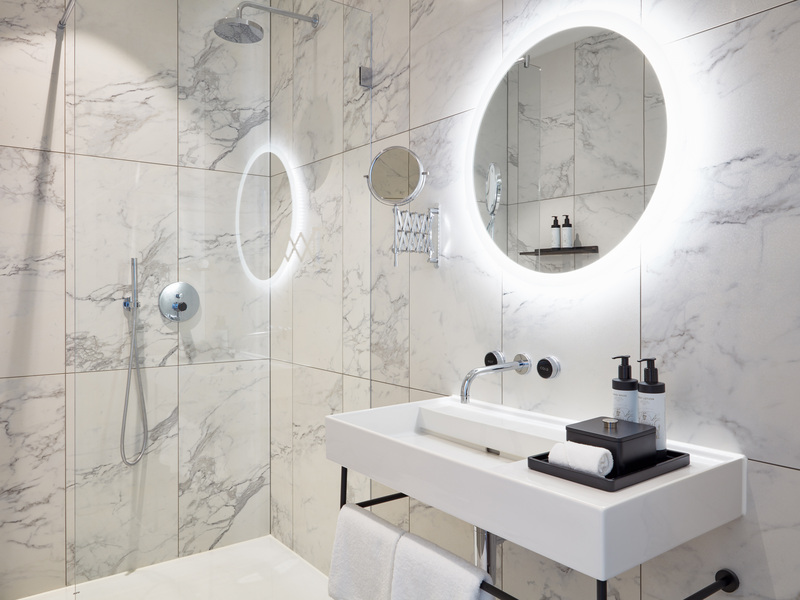 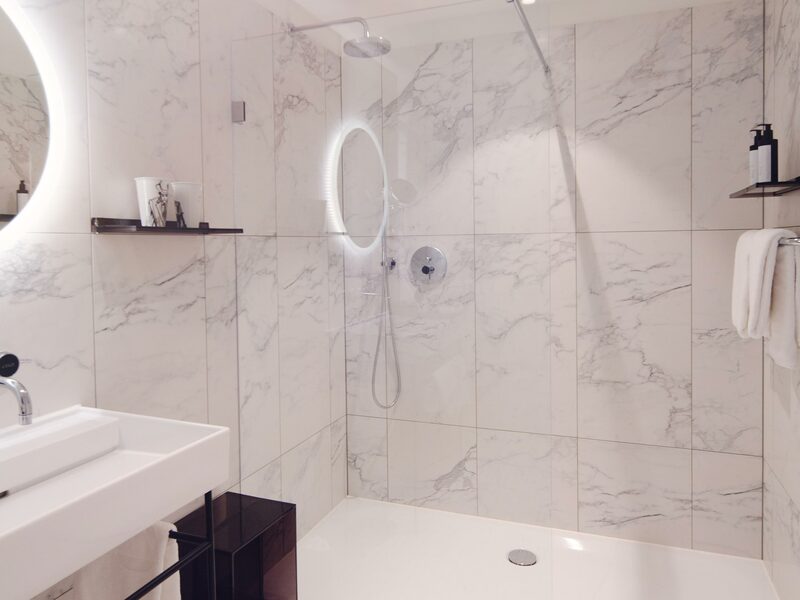 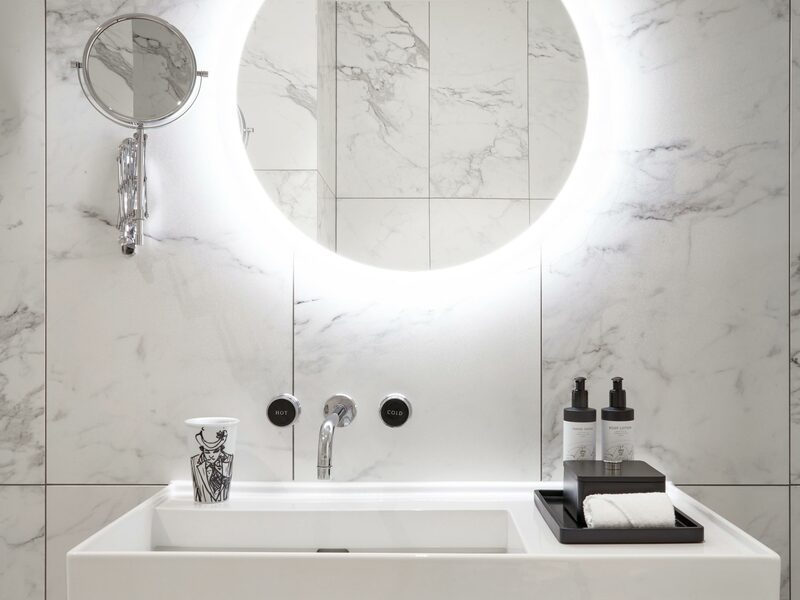 In the marble tiled bathrooms, this category offers a spacious shower equipped with in-house amenities and cosmetic products. 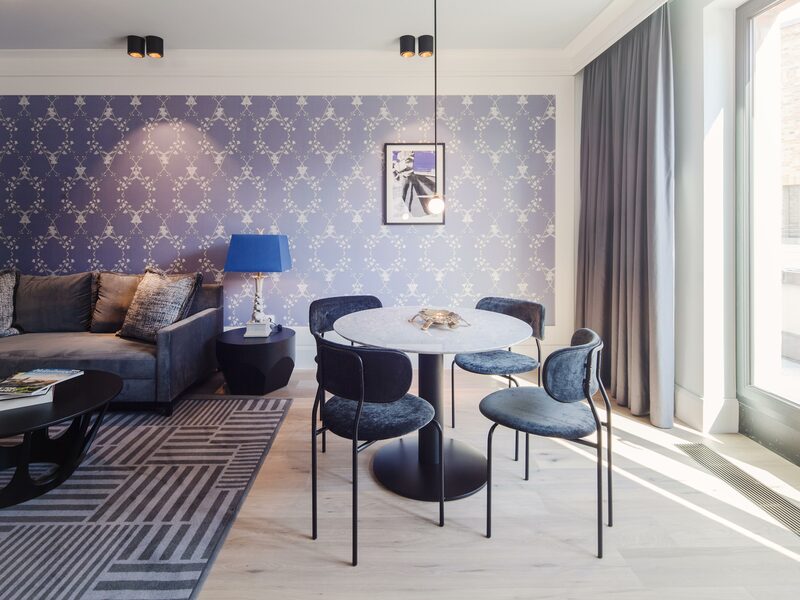 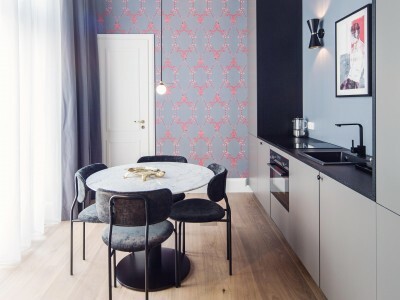 • courtyard or street view The rooms of the Medium category offer a ceiling height of 4 m and 25 - 29 sqm, providing a spacious and yet private home in the center of Hamburg. It is a place to relax and enjoy the individual atmosphere. 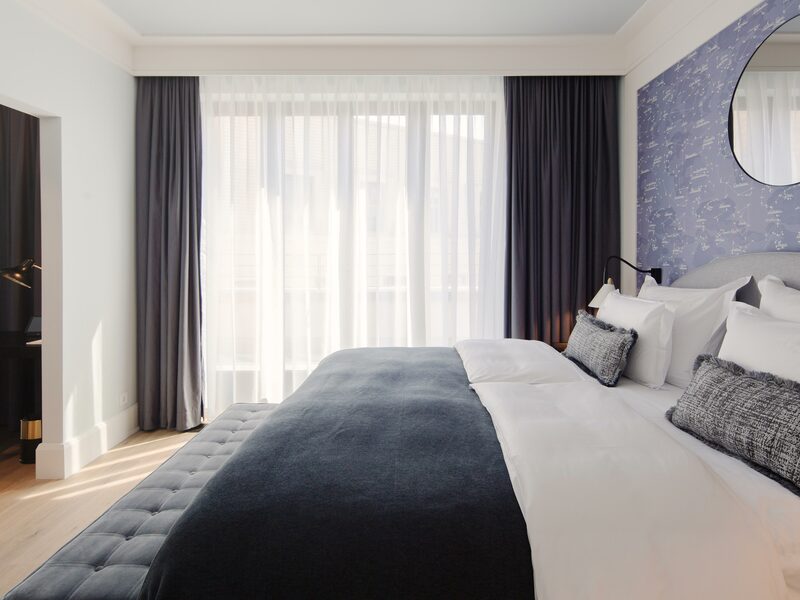 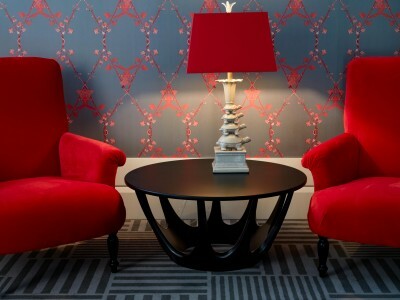 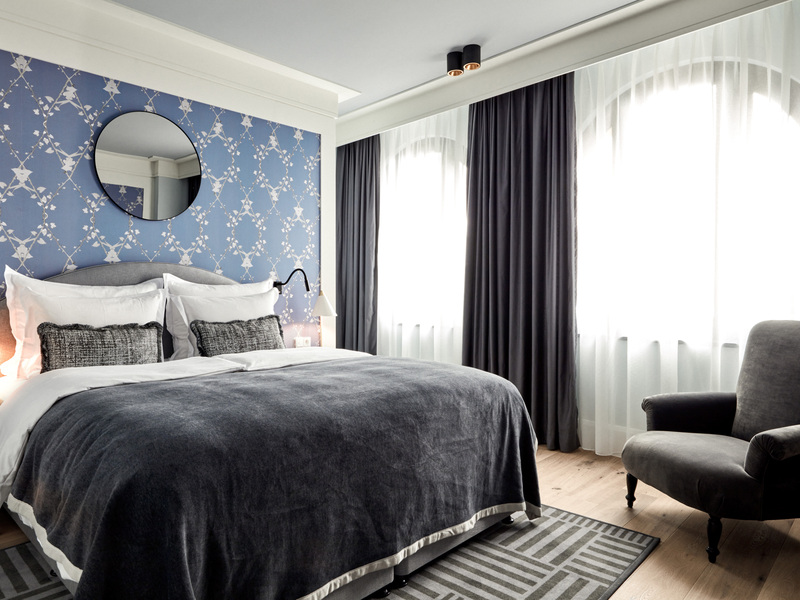 A lot of light, noble fabrics and stylish design elements ensure a comfortable stay. 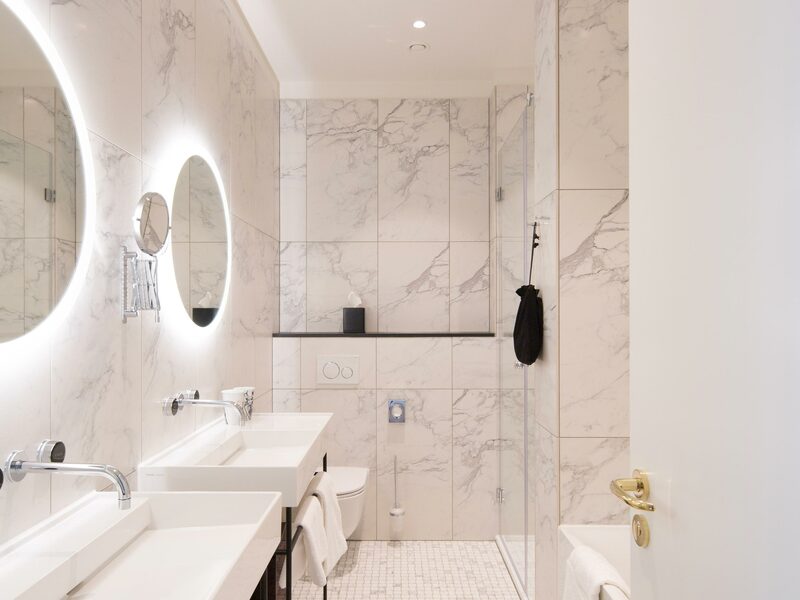 The bathrooms are marble tiled and offer a large shower or bath and are equipped with in-house amenities and cosmetic products. • courtyard or street view The Large rooms are spacious and ideal for recreation and relaxation in the middle of the city. 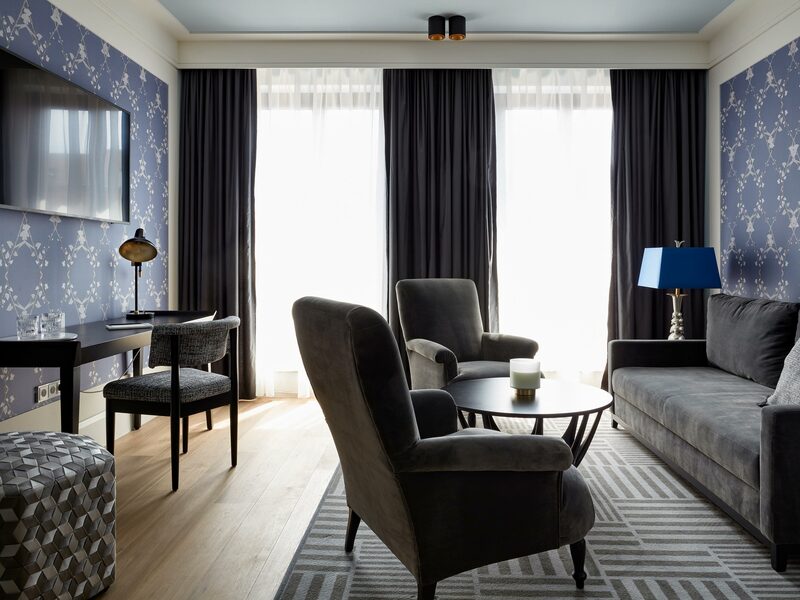 With partial 4 m high ceilings, the rooms feel light and spacious. 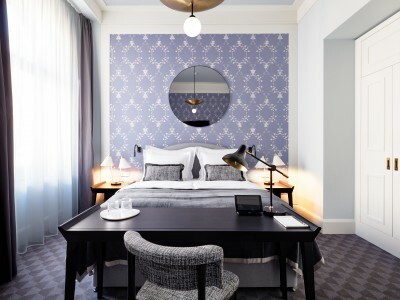 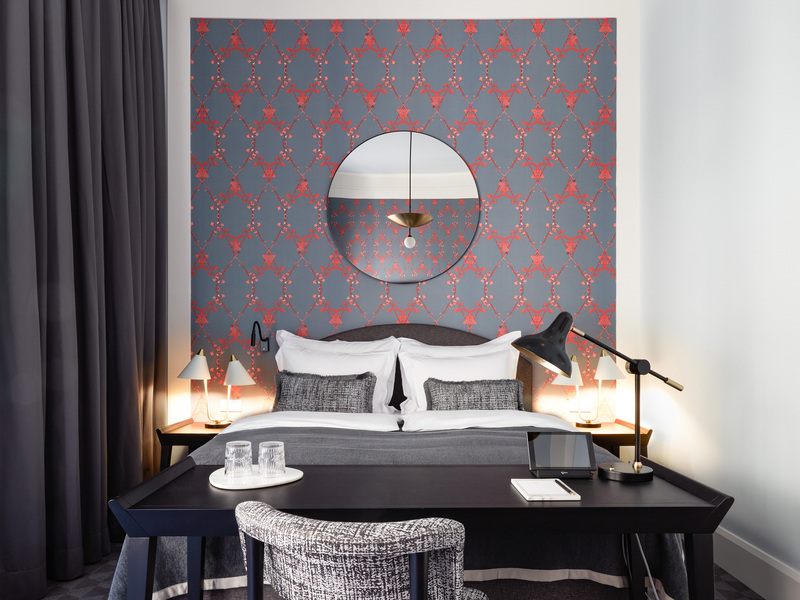 With 30 - 35 sqm, these stylish and timelessly designed rooms by Kate Hume offer high-quality comfort. 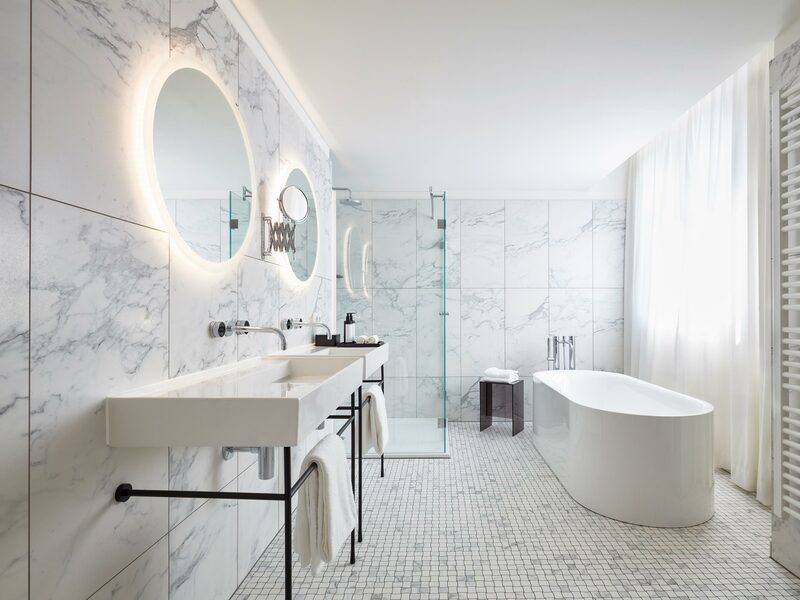 The spacious marble tiled bathrooms offer showers or bathtubs and are equipped with in-house amenities and cosmetic products. 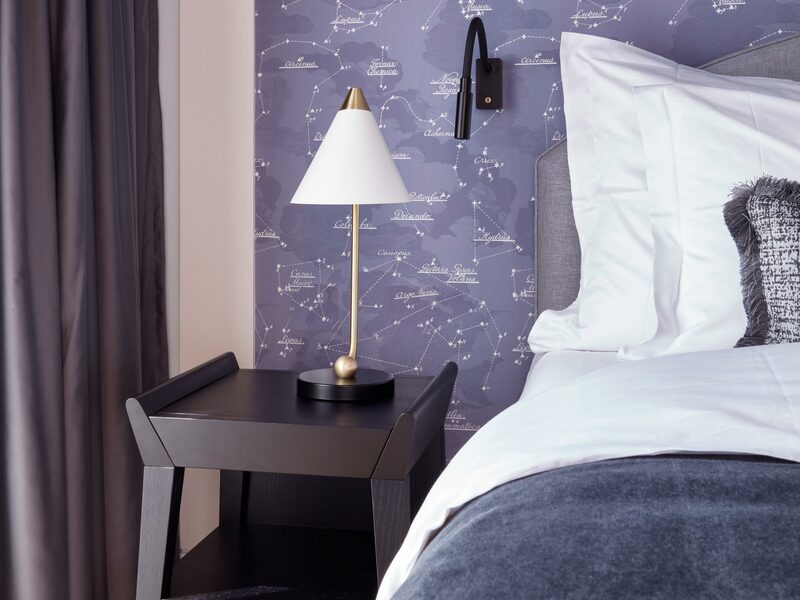 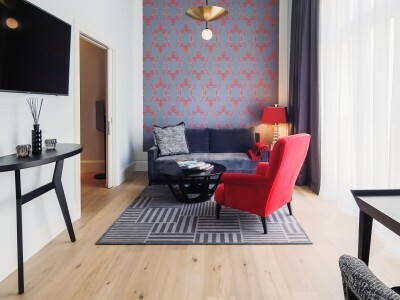 • courtyard or street view The Junior Suites combine luxury, design and nonchalance in a great fashion and they are a perfect home base during your stay. 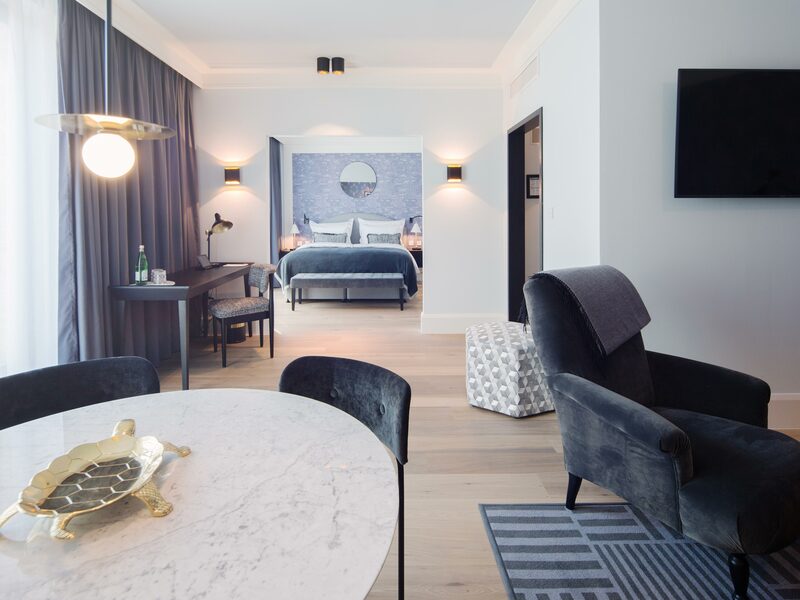 With 36 - 45 sqm, the suites create a wonderful relaxed experience thanks to high-quality furnishing and selected materials. 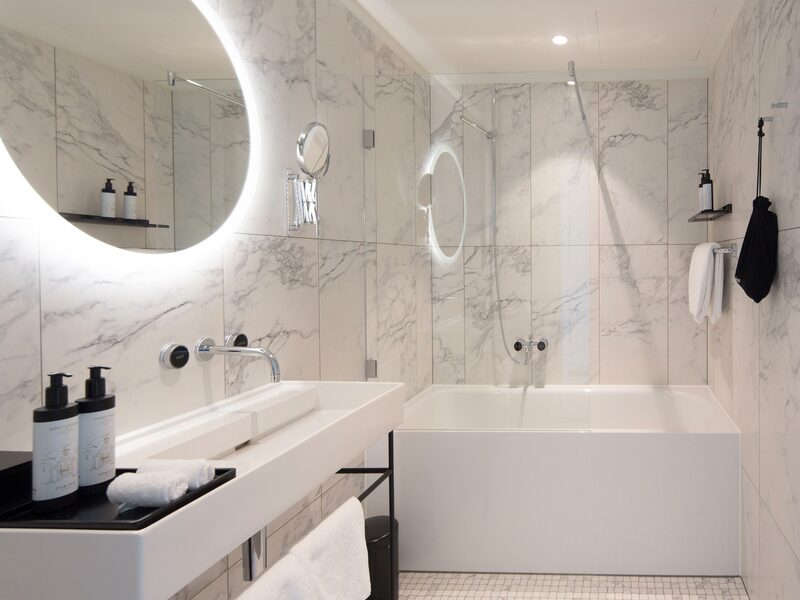 This category offers a shower or bathtub and the spacious marble tiled bathrooms are equipped with in-house amenities and cosmetic products. 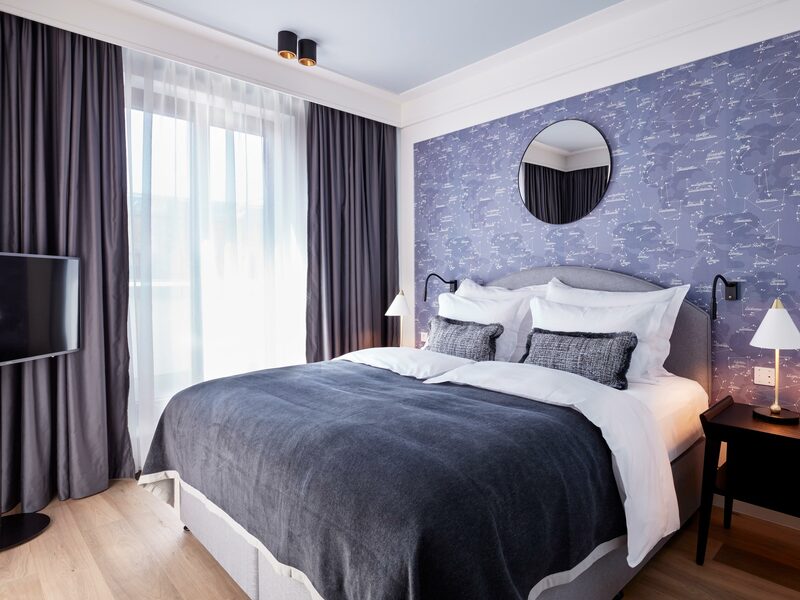 • Extra person on request Your home away from home, noble and exquisite, the spacious Apartments have a separate sleeping and living area as well as a kitchen. With 60 sqm of living space, individual design elements from Kate Hume ensure extra comfort even for a longer stay. 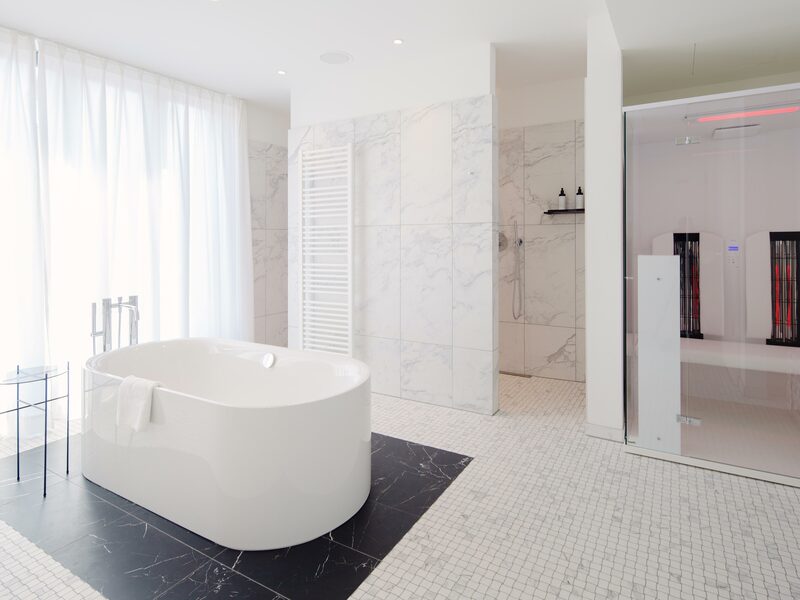 Impressive bathrooms of high-quality, tiled with bright marble offer a bathtub and a shower with a separate toilet. The bathrooms are equipped with in-house amenities and cosmetics product. 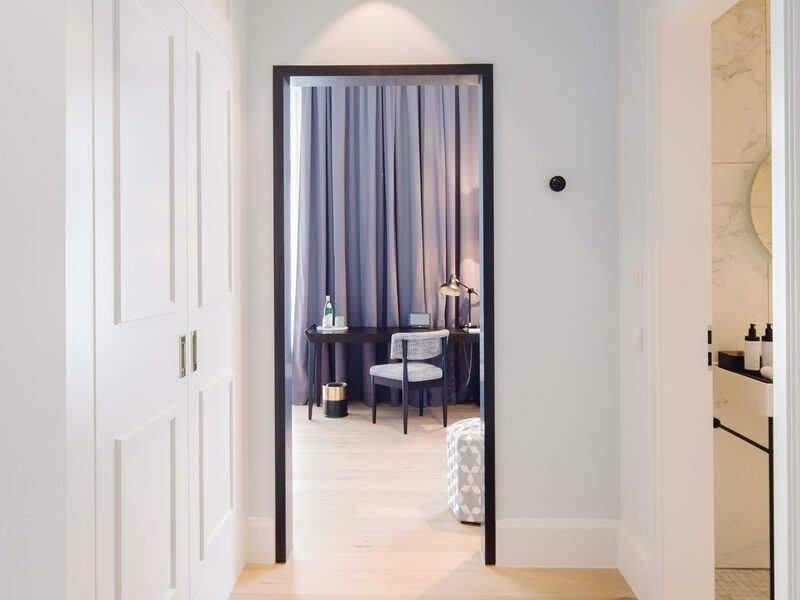 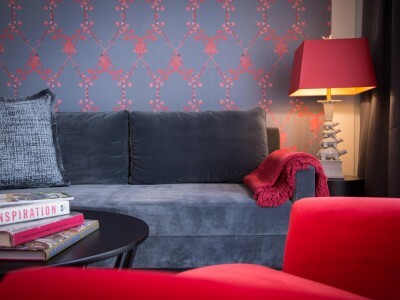 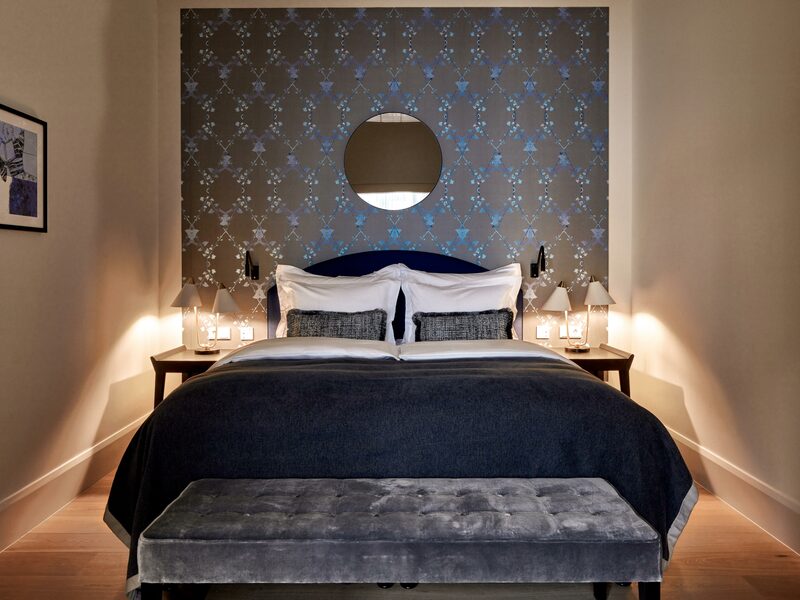 • Extra person on request Spacious, bright and individually designed by Kate Hume, suites offer a particularly luxurious stay. 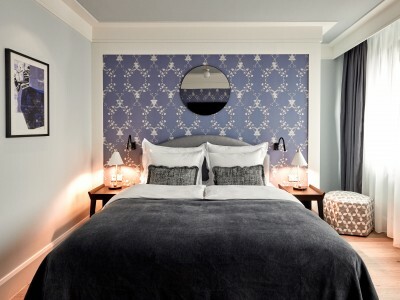 The separate bedroom invites you to relax in a unique relaxed atmosphere. The balconies offer a wonderful view of the historic Treppenhof. 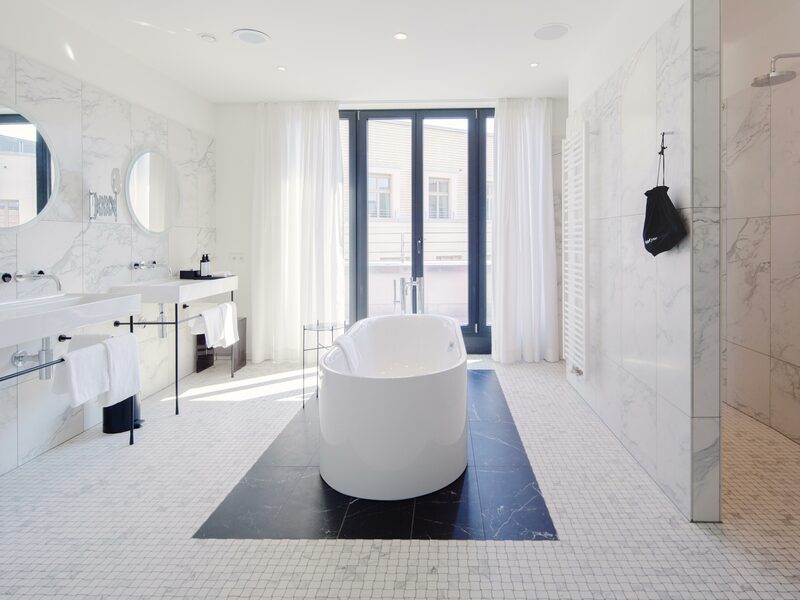 Rooms of this category offer a shower and a bathtub in the marble tiled bathrooms, which are equipped with in-house amenities and cosmetic products. 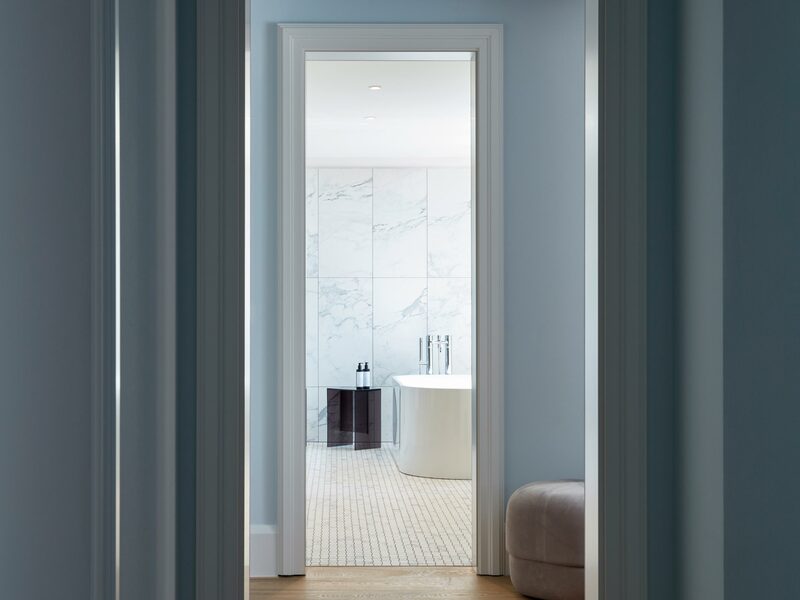 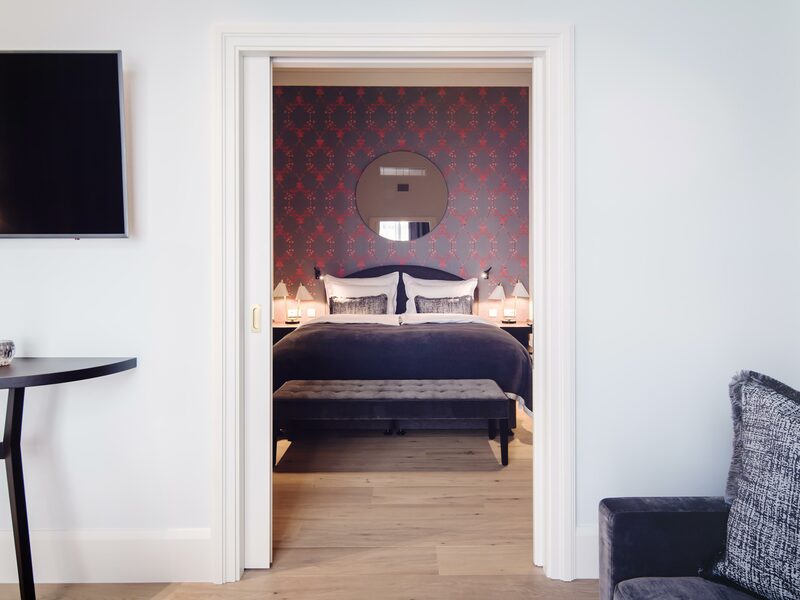 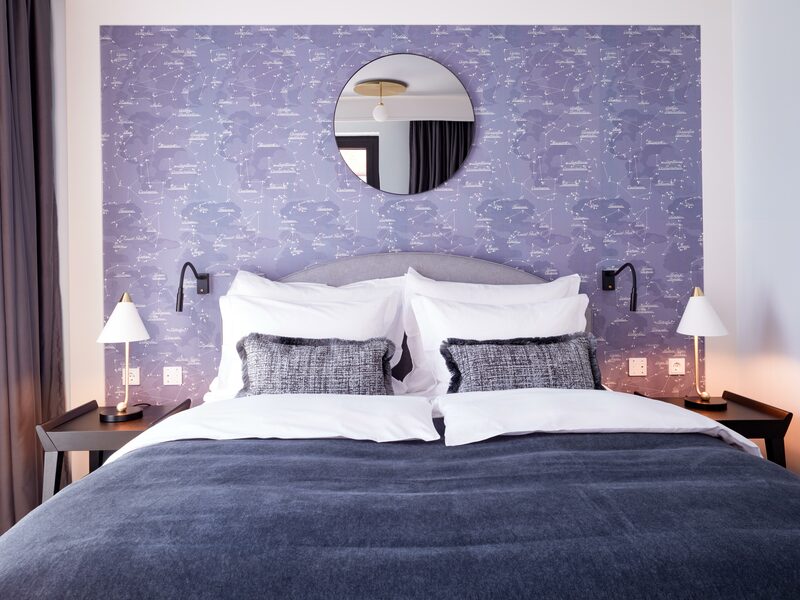 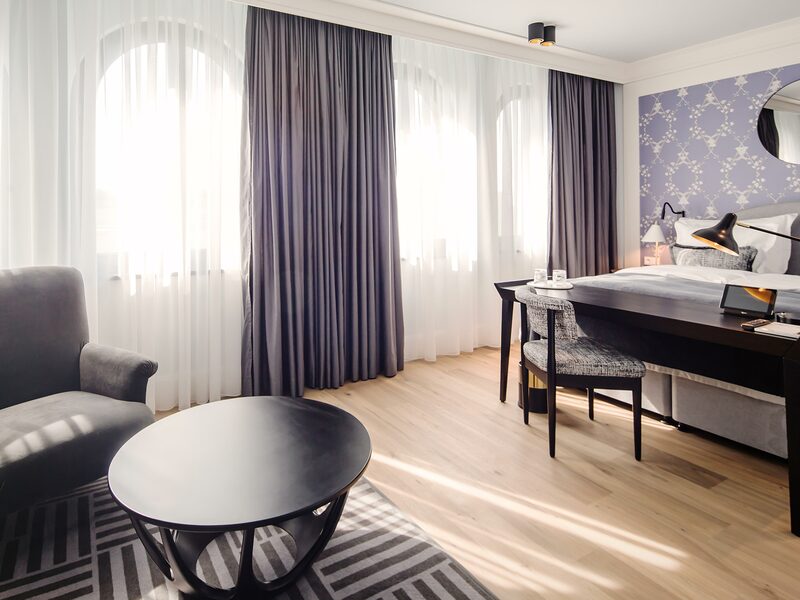 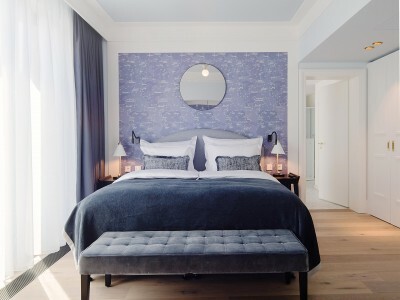 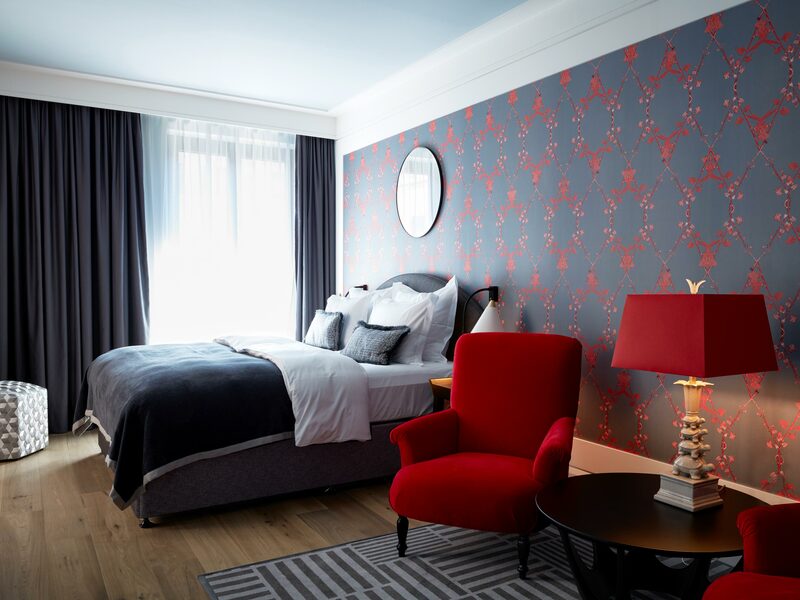 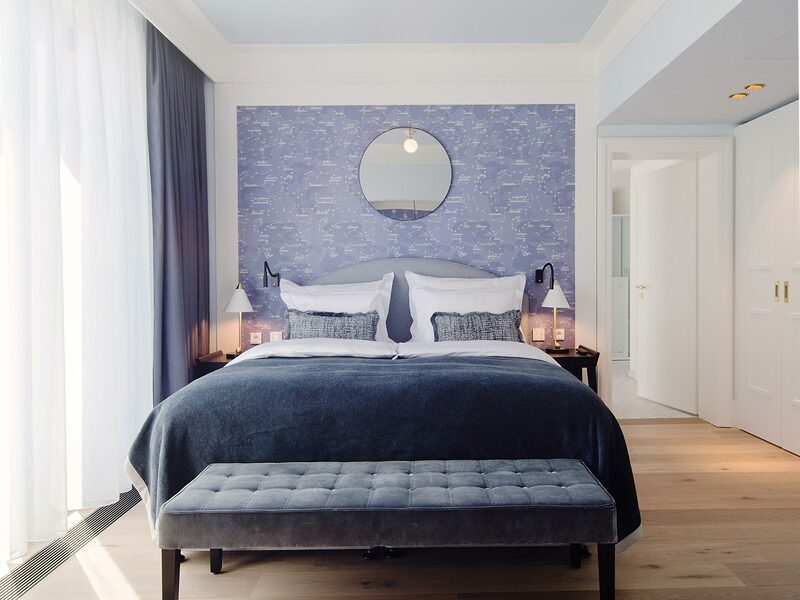 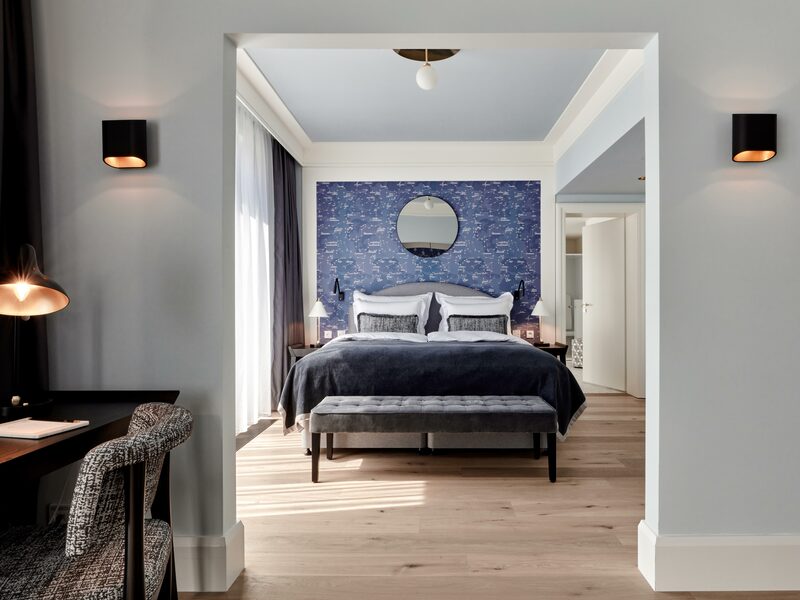 With a size of 70 sqm, the TORTUE Suite conveys a feeling of generosity. 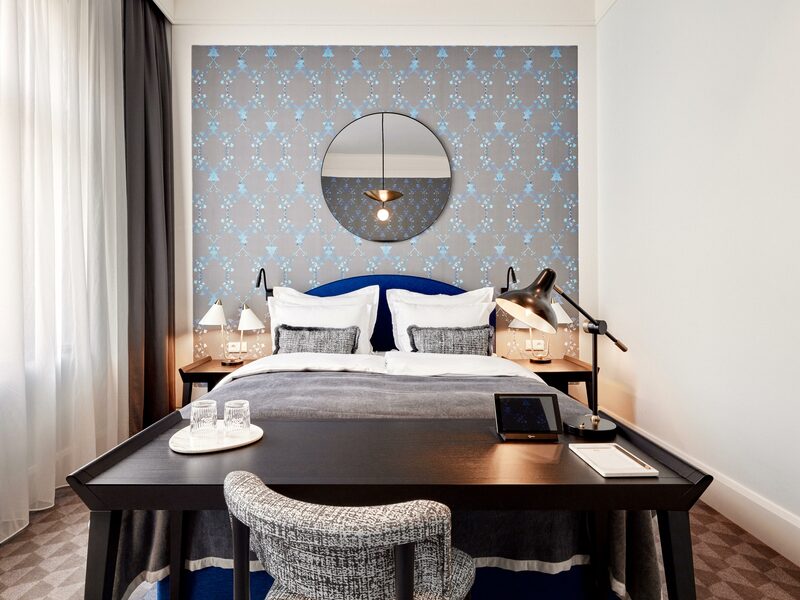 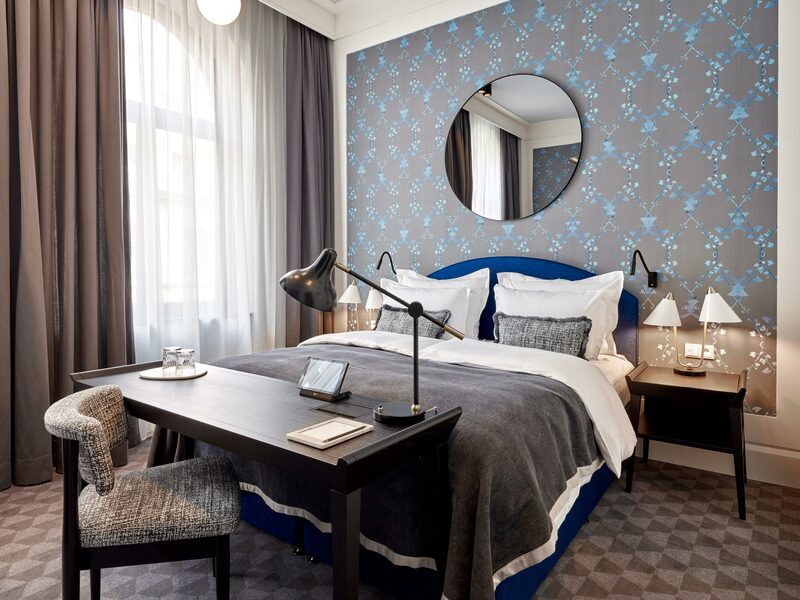 The room has a separate living and bedroom and is the perfect place to enjoy the hotel and Hamburg. 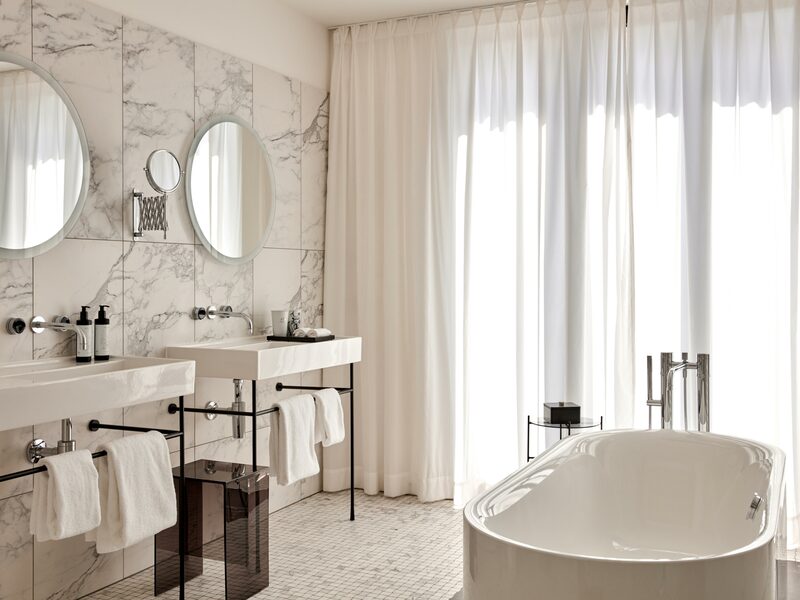 In addition to the spacious bathroom, the suite offers its own sauna and presents luxury at the highest level.